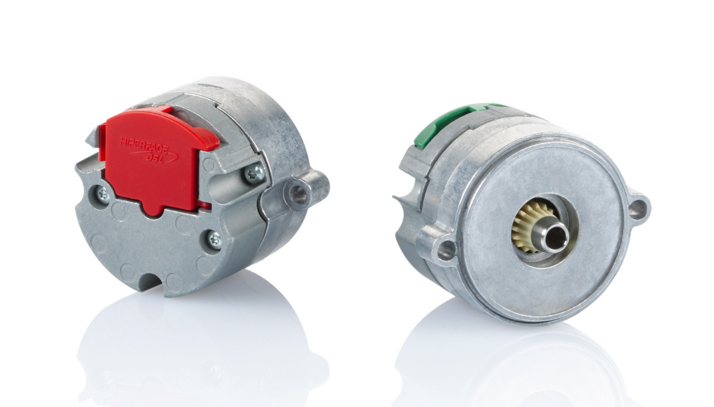 With the introduction of its EES37 single turn encoder and EEM37 multi-turn encoders, Sick has completed its product portfolio for Hiperface DSL standard servo motor feedback systems, while achieving an important step forward for drive technology, particularly well-suited to robotics and packaging machinery designs. The EES37/EEM37 absolute encoders provide servo motor feedback with 15 or 17 bit resolution for Hiperface DSL-enabled drives. The development has delivered digital data output and diagnostics for compact motor designs at a lower price-performance level, together with functional safety up to PLd and SIL2 levels where required. Because the encoders use a capacitive measurement system with a bearing-free design, they assure excellent resistance to shock and vibrations. They are well-suited for integration into the smaller servo motors, where rapid acceleration and frequent reversal in direction of travel are required. Easily-mounted to the motor flange and shaft, the encoders require only a single cable to communicate comprehensive motor feedback data and diagnostics, facilitating real-time condition monitoring. “With the development of the EES37/EEM37 encoders, Sick has introduced an important alternative to the resolvers still often used for standard servo motors at this end of the market,” explained Darren Pratt, Sick’s UK product manager for encoders. “Resolvers need a separate cable and do not provide the real-time diagnostic data that the Hiperface DSL technology now enables. As single-turn devices, resolvers are also not able to directly provide the absolute multi-turn information needed for robotics applications.